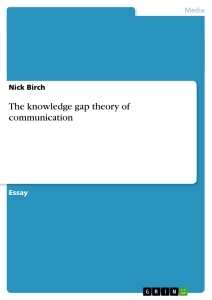 The Knowledge Gap Theory of Communication is primarily concerned with the unequal distribution of information throughout society and the correlating access to knowledge pertaining to socioeconomic status. The Knowledge Gap Hypothesis was first proposed in 1970 by threeUniversity of Minnesotaresearchers: Phillip J. Tichenor, then Associate Professor of Journalism and Mass Communication, George A. Donohue, Professor of Sociology, and Clarice N. Olien, Instructor in Sociology (Yoo Ri & Southwell, N/A). The hypothesis explains that there is a resulting divide between people of lower and higher socioeconomic status ‘as the infusion of mass media information into a social system increases, highersocioeconomic-statussegments tend to acquire this information faster than lower socioeconomic-status population segments so that the gap in knowledge between the two tends to increase rather than decrease’ (Tichenor, Donohue, and Olien, 1970, p159-160). The resulting speed at which people are able to access tradition mass-media compared to modern systems may be surprisingly congruent when underlying education is taken into consideration. Addressing primarily large scale social aspects such as public affairs or health care issues, the authors argued that exposure to media would have an effect on people, but whether the effect was knowledge acquisition (and what level of knowledge) would depend on a number of factors including education; communication skills; existing knowledge; relevant social contact; selective exposure, acceptance and retention of information (e.g., print versus electronic media); power and control over media outlets; community structure; and redundancy in media coverage. Identity Management Theory - Eine Untersuchung "Kulturelle Identität von Belarussen im Ausland"